In Madrid we like to eat delicious and varied food. We don’t miss out on the opportunity of eating in the latest and most fashionable restaurant or in the famous one which promises a world of sensations on our palate. However, when push comes to shove, who can resist a traditional Spanish omelette? Runny or not, with our without onion but Spanish at the end of the day. 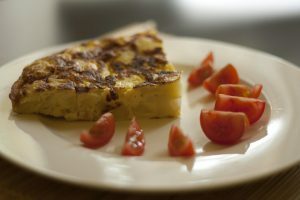 If reading this is making you hungry, don’t miss out on the route stated below to try the best Spanish omelettes in Madrid. Ready, steady, eat! This restaurant at number 13 on Calle Colón has been preparing one of the most popular omelettes in the Spanish capital for more than 150 years. It fills up every day, especially on weekends and you can’t leave this tavern without trying its tapas made with cold cuts and pickles and, above all, its wonderful Spanish omelette with onion. Warm, freshly made… simply irresistible! This Spanish omelette temple is a classic stop for lovers of this traditional recipe. You can find it in the middle of Mercado de la Paz, on Calle Ayala, 28, and on its bar you can try omelette with onion, without onion, as a pincho (small slice with bread), full size, to eat in or to take away. You know that a place is good when it’s always full of regular customers who only speak highly of it. On Calle Ibiza, 38, you can find another reference for omelette lovers. Taberna Pedraza has a masterful recipe to make its delicious omelette, using only new potatoes and four free-range eggs. Its intense yellow colour is simply spectacular! If you are looking for exclusivity and an omelette made just for you, head over to Támara Casa Lorenzo, on Paseo de la Habana, 107. This restaurant services traditional cuisine accompanied by good wines but the real star of its menu is its Spanish omelette, a dish prepared by order only when you make your booking, detailing the number of guests in order to adjust the size of the omelette. Freshly made when you arrive at the restaurant, what more could you ask for?